Need Banner Printing? We Have You Covered! Need Banner Printing? We’ve Got You Covered! At ImagePak Marketing, we offer banner printing and a full range of banners. Banners are extremely popular in the Perth area now because of their versatility. They are a very inexpensive but efficient way to advertise your business. Here are a few of the different banners we have to offer. Vinyl banners are the old standby. Our most popular sizes are 3m x 1m and 2m x 1m. We can print on one or both sides. We can provide a single or double gusset to reinforce the banner for hanging. The banner will have ropes and eyelets. Teardrop banners are, as you might guess, shaped like teardrops. They are also called teardrop flags. They come in three different sizes: 2.5m (Small), 3.5m (Medium) and 4.5m (Large). They come in six different shapes. All are designed to attract attention for your business by flapping in the wind. Printing can be single or double sided. Pull up banners are pulled out of a base on the floor. Because they are tall and easily blown over, they are only offered for inside use. They are perfect for promoting a product, event or service at indoor event venues, retail outlets or offices. Pull up banners are 800mm wide and 2,000mm tall. As with all of our banners, they are printed in full colour. You can bring a photo or logo with you or you can choose from a number of colours and fonts. Tell us what message you want and we will print it for you. 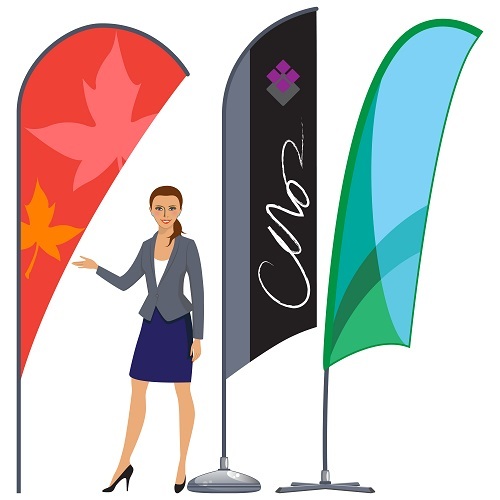 Pop up banners are relatively new and have a modern look to them. Most are kidney shaped and they are expandable. They sit on the floor and have a fibreglass frame. They are great for promoting a business indoors or outdoors. If you would like to learn more about our custom banner printing services, call (08) 92444 111 today.